US equity markets staged an impressive intra-day comeback on Friday night to close just above breakeven for the session. The S&P500 was down -0.8% at the low but closed +0.1% while the Dow closed more than 100 points off its lows. 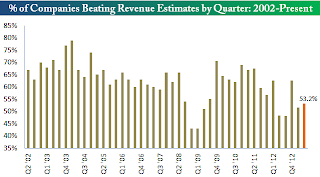 Of the 260 companies of the S&P that have posted 2Q results so far, 73% have beaten earnings estimates while 57% have beaten revenue projections. This shows the majority of beats continue to come from improved efficiencies, lower expenses and lower interest costs rather than improving end demand. Hopefully this will change, if the University of Michigan Index of Consumer Sentiment is any indication. The index unexpectedly advanced to 85.1 in July from 84.1 in June to reach its highest level in 6 years. 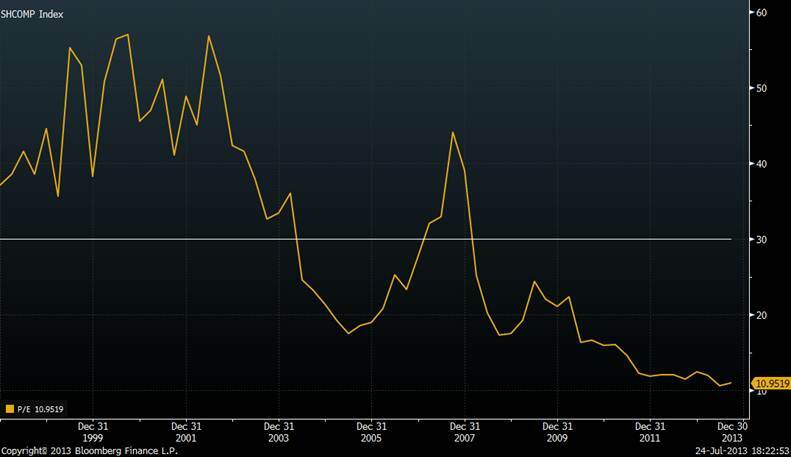 This index is finally out of recessionary territory and now back in "normal" territory. Arguably of greater importance is forward earnings revisions. So far in July, S&P500 upward earnings estimate revisions ticked up to 49.8%, up from 48.3% in June. So far earnings season has been ok but not stellar...and this is against pretty low expectations. One of my "pet" tech stocks, Activision Blizzard, gained +15% after agreeing to buy back most of the stock Vivendi are selling. I would look to take profits after this move. Another one of my "pet" stocks, JC Penney, rose +2.3% following news that David Einhorn's hedge Fund Greenlight has taken off its short position in the stock. My/clients' positions here are via short put options, happy to let them run. 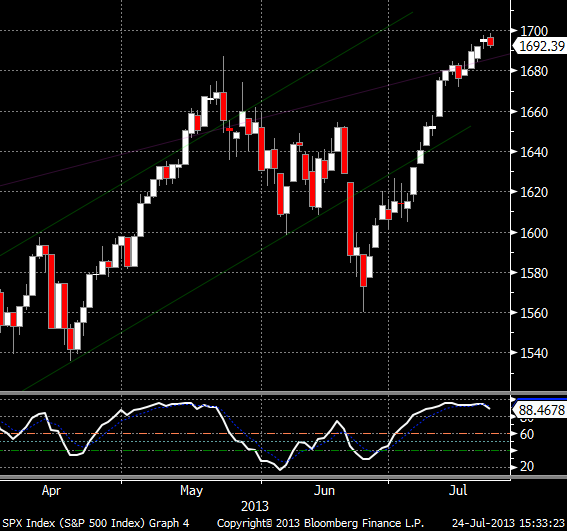 Out side of the roller-coaster in equities, not a lot else happened overnight. In FX the USD remained choppy. FX positioning will be tested next week with a big line-up of data to be released including US GDP, the FOMC, ECB, BoE and Nonfarm Payrolls. Having broken near term consolidation to the downside, USDJPY looks set for a move down for a test of the major uptrend line. 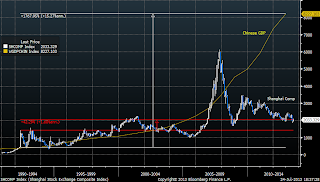 I expect USDJPY will weaken to 97 or so before resuming its uptrend. A break of this uptrend line would be a major warning sign for Yen bears, Nikkei bulls and risk-on in general (this not my base case but something I am watching). Note that BoJ Governor Kuroda is giving a speech on Monday. If he tells the market that BoJ will be easier for longer than expected, Yen weakness could resume more quickly. There has been much chatter this week as to who will be the next Fed Chair, following Bernanke's retirement next year. The market had been assuming Janet Yellen was a shoe-in for the role until earlier this week, the Washington Post's Ezra Klein reported that Larry Summers is now the frontrunner for the role! I must admit I feel greater sympathy for Summer's critics, as expressed here and here. The latest from Klein suggests the potential spat that could ensue between the two candidates could render both ineligible. Attempting to quell the debate, the White House has said that Obama has not yet decided and likely wont announce anything until the fall. 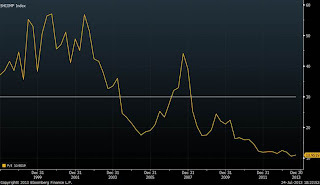 So where to from here for equities? The S&P500 so far this year is up +19%. Given long run average annual stock market returns are in the region of 7-10% - and we are heading into August! - one could argue we are well due for a pullback. This is my view in the short term. However when you consider that the market has barely managed a 2% compound annual return since 2000 one could also argue the market has some catching up to do. I am open-minded to this point of view over the longer term. The current S&P500 earnings multiple of 16x is consistent with the long run average (see last Thursday's post) so that doesn't offer much of a clue to future market direction. So my preference here is to stay long but begin hedging with some index puts / put-spreads. Also if you have a predominantly long equity exposure, there are a few select shorts I am pondering this weekend. Again I don't want to be outright short this market but would be happy to spend some relatively cheap premium on some equity put-spreads. Mark Hulbert wrote an article 3 Signs the Market is Near a Top on 24 July that helps add fuel to the bearish fire! Looking at the chart of the S&P (below): the shorter term green up-channel worked well...until it didn't. Of greater relevance now is the longer term purple trend channel which is again posing some upside resistance. For all of the reasons I posted on 25th July I think the path of least resistance short term is downward. 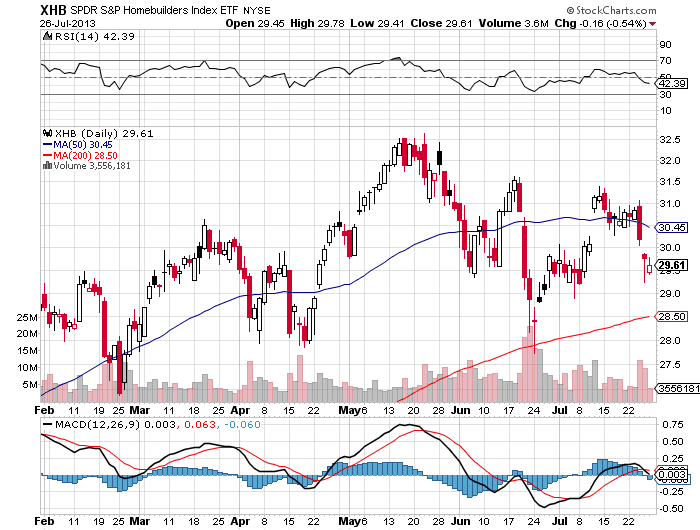 Another factor that causes me to be cautious on this market short term - the Homebuilders sector. This sector has shown strong leadership throughout the rally but has been trading sideways to down for the past couple of months (see chart below). Given how integral the housing sector is to the overall economic recovery in the US it makes intuitive sense that this sector should lead the market. Now the canary in the coal mine perhaps? Worth at least paying attention to I think. Buy puts on Google. Now look, I love this company and from a fundamental perspective it ticks most every box you look for as an investor. But as a trader, the technical picture argues for a short term correction. It looks to me to have completed an Elliot 5 waves up and with a double-top against declining momentum I think such a correction will be big enough to play for the downside move. (The other thing playing against GOOG is it remains the most owned stock by the hedge fund community...a bit like Apple was when it was $700. The recent earnings disappointment could see some of these guys look bail out). I would target a ~10% move to the downside to $800-ish initially. Overnight, US stocks retreated from their record peak in what was one of the busiest days so far in the earnings season. A pair of downbeat reports from Caterpillar and AT&T weighed on the Dow while Broadcom fell -15% for the biggest decline in the S&P500 after issuing forecasts that trailed analyst estimates. Apple gained +5.1% following last night’s small beat (on beaten down expectations). Volume, as it invariably is on sell-offs lately, was the highest in 3 weeks. So using a very popular and widely understood – if simplified – valuation metric, US stocks appear fair value against history. 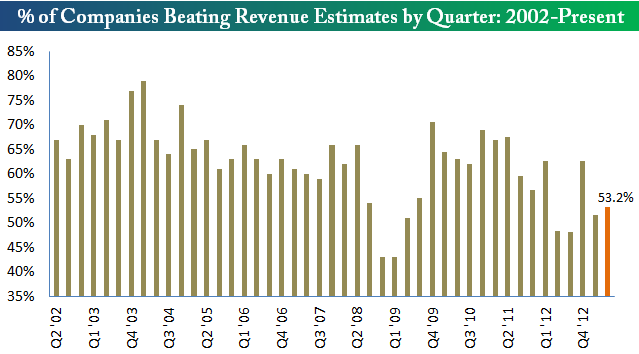 What if analyst earnings estimates for 2015 are right? The "Street" estimate for EPS for the S&P500 in 2015 is 135.32. Furthermore, what if stocks in 2015 are trading on an earnings multiple of…let’s say 20x (approx. 1 standard deviation above the average earnings multiple of 16x). Such multiple expansion could be the continuation of the trend we have seen since 2009, resulting inter alia from a lack of other attractive investment alternatives in a zero interest rate world. Well…we would then get an S&P500 target for 2015 (and I can hardly believe I’m writing this) of 2,706, i.e. ~1,000 index points higher than where we are now. So if you are looking for a reason to be bullish US equities longer term - see above! DISCALIMER: This thought experiment should make you realise just how nutty trying to pick forward stock or index prices is. Trying to guess forecast earnings is one thing. But bear in mind that an earnings multiple is a reflection of people’s feelings about the future. So in forecasting guessing a future earnings multiple, we are trying to guess how people will be feeling about the future in the future! If someone said to you “I think people will be in a 20% better mood about the future in 2015” you would think they that were crazy. But when someone does the same thing in projecting future stock/index target prices, we have the good manners to call it analysis! Not only has the S&P500 risen +8.5% since 24th June (that’s +178% annualized! ), it has risen 16 of the past 21 trading days – including 12 of the past 14 trading days. I dislike using the term “overbought” but in this case I’m prepared to make an exception: Price action, technical indicators, volume patterns, a collapsing VIX and bullish sentiment surveys all lead me to conclude that "overbought" is where stocks are in the short term. Expect a pullback. 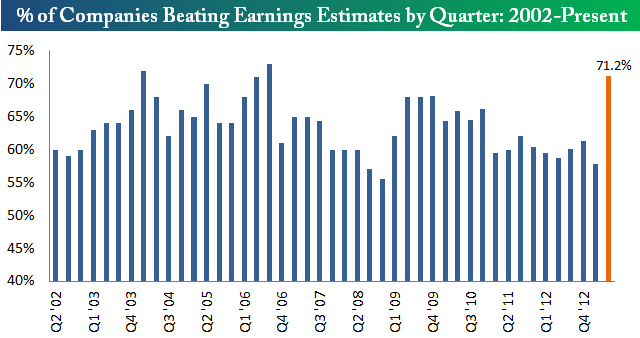 The 2Q earnings season so far has been pretty good. As I foreshadowed a couple of weeks ago, low expectations for this earnings season were likely to be the market’s saviour. 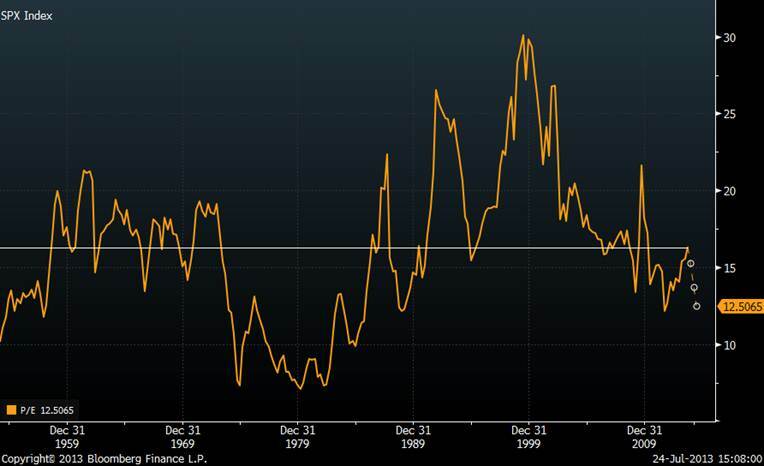 The concern being – with operating margins skirting all-time highs, how much juice does the cost cutting/margin expansion story have left in it? Large cap financials (e.g. GS, Bank of America, Citi), healthcare (e.g. Baxter, JNJ) and industrials (e.g. Lockheed Martin, GE) have been the positive standouts so far this reporting season. Big tech has had a bumpy ride with disappointments from Microsoft, Google and Intel…fortunately Apple managed a small beat on sales and earnings. And here’s a staggering statistic for you to consider: The Shanghai Comp is lingering near four year lows, just 42% above 1992 highs, despite an incredible 1,768% rise in Chinese GDP over the past 21 years! 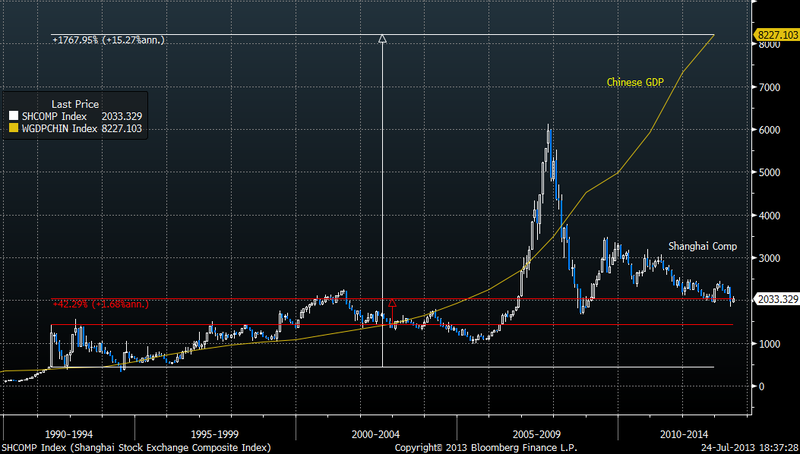 And the valuation argument for Chinese equities is starting to look compelling.